The exhibition “WOW! 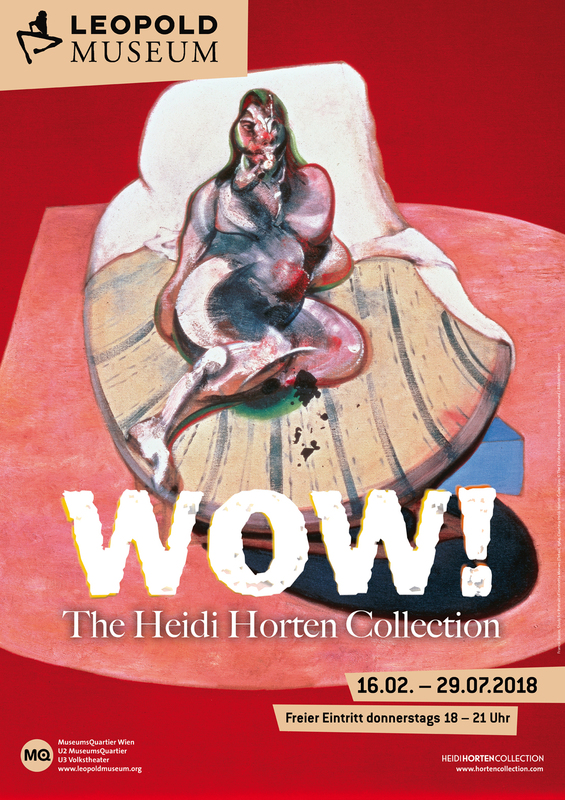 The Heidi Horten Collection” is the first public unveiling of one of Europe’s most sensational private art collections. Its presentation at the Leopold Museum fulfils the collector’s long-cherished wish to make the master- pieces she has carefully assembled since the 1990s, spanning from Gustav Klimt to Andy Warhol and Damien Hirst, available to a broad audience. The exhibition, curated by Agnes Husslein-Arco, showcases 170 works by seventy- five artists and follows a chronological sequence of twentieth-century Western art. It also offers a unique view into the broad spectrum of art the collector has gathered over the past thirty-five years. Heidi Horten and her husband Helmut Horten started their art collection in the 1970s. At that time, they both focused on works of German Expressionism. Following her husband’s death in 1987, Heidi Horten decided to build her own collection based on new priorities. Disregarding prevailing trends in the art market, she concentrated on international works of Modernity, Neo-Expressionism, and American Pop Art, thereby creating a collection unique in quality and focus. The Heidi Horten Collection includes some 300 paintings, graphic works, and sculptures by world-class international artists, which has resulted in a representational cross-section of art history from Modernity to the present. Aside from German Expressionism, with masterworks by Ernst Ludwig Kirchner, Erich Heckel, Emil Nolde, and Max Pechstein, key areas of focus in the Heidi Horten Collection also include abstract approaches by Cy Twombly, Mark Rothko, and Ernst Wilhelm Nay, and works by prominent figures from American Pop Art like Andy Warhol, Jean-Michel Basquiat, and Roy Lichtenstein. Further strengthening its international scope are indispensable works by Marc Chagall, Georg Baselitz, Francis Bacon, Fernand Léger, Gerhard Richter, Yves Klein, Lucio Fontana, and Damien Hirst.